As partners, the Office of the Provost and the Center for Teaching and Learning have launched the Diversity & Education Series: Inclusive Pedagogy in Action. The series will bring leaders and groups from other institutions to campus to discuss how to create a more inclusive climate and development opportunities that exist at Yale. October 20, 2016: Frank Tuitt, Ph.D.
November 3, 2015: Kimberley Tanner, Ph.D.
Dr. Kimberley Tanner serves as Professor of Biology Education and Director of SEPAL: The Science Education Partnership and Assessment Laboratory at San Francisco State University. Dr. Tanner is “interested in how people learn science, especially biology, and how teachers and scientists can collaborate to make science teaching and learning in classrooms – kindergarten through college – more like how scientists work.” This presentation and discussion is co-sponsored by the Helmsley Scholars Program and Faculty Teaching Initiatives at the CTL. January 24, 2017: Elsa Núñez, Ph.D.
Dr. Elsa Núñez serves as President of Eastern Connecticut State University in Willimantic. Dr. Núñez is committed to providing access in higher education. This is “evidenced by data that shows Eastern has the highest percentage of minority faculty among all colleges and universities in Connecticut. This and other factors have enhanced the retention rates of underrepresented student populations” on-campus. 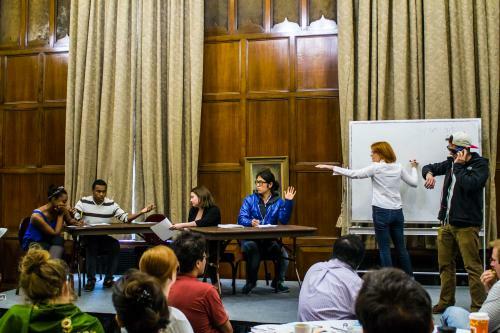 The CRLT Players, as part of the CRLT Theatre Program at the University of Michigan, use a variety of performance modes and facilitation strategies “to develop and sustain a University culture that… creates learning environments in which diverse students and instructors can excel.” Using theatrical representations of a range of issues common in academic life, the performances spark dialogue among faculty, graduate students, and academic administrators, with particular emphasis on issues affecting institutional climate. These performances is co-sponsored by the Helmsley Scholars Program and Faculty Teaching Initiatives at the CTL as well as the Office of the Provost and the Title IX Coordinators at Yale.